Are you ready to take the Affirmation Challenge and transform your life? The steps are quite easy, however it is up to you to put in that effort to work on re-training your mind. You will find that your ego (mind) has had such control on your life.The idea is to reboot and redirect your thoughts from the ‘default setting of doubt, lack, worry and fear. They now need to be transformed into more positive, nurturing, and uplifting thoughts that put your mind, heart and soul at ease and allow for magic to happen and the universe to do its thing.Read through the steps below and get started. Let your friends know. Get a group together for moral support and to keep you committed and on track (there is a real power in numbers). You are welcome to copy the image on the top of the page and share it on social media. First of all, you need to pick one day. It could be today, tommorrow or a day real soon that is a bit more free on your calendar. Book it in. Make the commitment to yourself! Let’s call this ‘Inventory Day’. Time to take an inventory! For this whole day that you have chosen (from step 1), you need to absolutely dedicate yourself 100% to watching, observing and analysing your thoughts.You will need to pay vigilant attention to everything that you think and say. It’s a good idea to keep a journal or jot down some of your thoughts in a notebook or piece of paper. Perhaps you could even draw up columns with the headings ‘Positive Thoughts’ and ‘Negative Thoughts.’ Note: Don’t try to change your thoughts at this point, try to be neutral and objective. Just let the thoughts flow naturally throughout the day. This step is about objective self-analysis, observing and recording anything that you notice or that stands out. 1 – Your thoughts are extremely positive. Congratulations!! you probably do not need to take the challenge! 2 – Your thoughts are mostly positive, though you have the odd lapse. 3 – Your thoughts average in the middle between positive and negative. 4 – You realise that your thoughts are mostly negative, though sometimes you can be positive. 5 – Time to check into a clinic :). You discover your thoughts are predominantly negative. Congratulations on taking a long hard look at your mind habits. You really need to take this challenge! And support is here for you. Now, choose a new time period which you can dedicate wholeheartedly to going the next level and not only monitoring but also actively changing your thoughts. It might be a period of one day, three days, a week, one month or more, or anything in between. I recommend starting as soon as you can, and doing this for a good solid week or a month to get you started on your road to transformation. And don’t forget to mark it on your calendar. Get creative – draw colourful borders or something to remind you. Have a journal or notebook ready for the next step. Now that you have your time period sorted, time to get started. You will be going about your normal life, however you will have committed yourself to being ‘aware’ and ‘conscious’ of your thoughts. The idea is to ‘catch’ your thoughts as they happen. Whenever you find yourself having a negative thought, go through the “CCC” process. Here it is: Catch it, cancel it, then covert it. 1 – Catch it – Catch that negative sentence straight away. 2 – Cancel it – You can do this in a number of ways such as saying something like “Cancel, clear, delete,” “I cancel / erase that statement,” or “I completely cancel that sentence I just said”. You can also support this with some quick energy work. Either swipe your hands in the air like you are pushing your thought / the negative energy away, or visualise throwing it in a little invisible rubbish bin that stays permanently beside your foot (you can also gesture the movement of throwing the thought into the bin beside you. 3 – Convert it – Convert or replace the negative thought with a positive version. This is just a matter of turning the words around or finding a positive way to say what it is you wish to express. If you really find this step difficult, ‘fake it till you make it’. 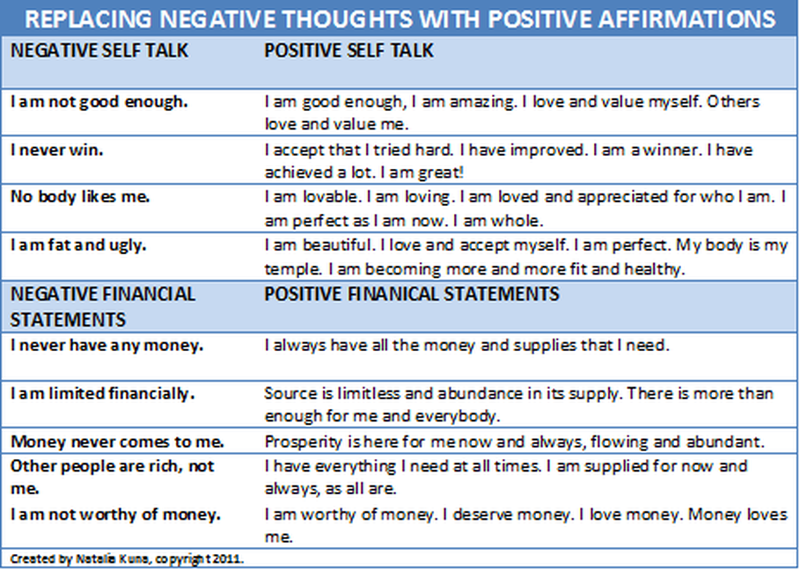 Tools and Tips to Help You OutTo help you out, see the list of examples of how to replace negative thoughts with more positive affirmations (view the chart below). Is Spirit Knocking at Your Door? Recently, I have felt that Spirit is knocking at my door. Now I don’t mean spirit as in ‘ghosts’ (though I do include them in my broad definition, because they definately speak too). I am talking about Grande Spirit. Source. The FORCE. It’s in the sweet humming of a bird outside your window that reminds you of the beauty of having a life on earth. The rustling of the trees as a little squirrel scurries into the bush half fearful half playful – reminding you that you are not alone. It’s in the glistening leaves brushed by the sun as it ends it’s day, making you feel all cosy knowing you’ll be home soon to your home-cooked meal. It’s the numberplate that you notice while driving that says a word that you know is a specific message for you. It’s overhearing a conversation and something that they say clicks and the question you asked yourself in the morning has now been answered. It’s when you see a look-alike of a friend or relative cross the street infront of you which reminds you to give them a call. These are basic examples that we can all find in our everyday lives. It’s up to us to notice them, absorb them, thank them, and take heed. Spirit is alive. It is all around us. Do yourself a favour and today when you step outside, really see, breathe and feel the environment around you. Notice all the little details. Use all your senses. get into the habit of observing and staying as much as possible in a state of awareness. This is easier to do when we feel centred and at peace. For those of us who are spiritually adventurous and metaphysically curious, or just plain open and aware; things start to get clearer and louder. The supersonic sounds of a midnight frequency attunement makes our ears ring and drone in fluctuating waves. We wonder what it means and what’s really happening. We try listening, tuning in, or just allow it to be and do its work. We may receive clear, vibrant images that come as visions or bequested insights of the inner eye. Our body may tingle and flutter or shiver and shudder in magical intensity. Or we may have a palpitating sense of unmistakable, powerful ‘knowing’ that occurs from an interdimensional connection to Spirit. These flashes of signs, snippets of clues, glimmers of insight are here just as they were in ancient times. In fact now more than ever, in this technological, robotic, frenetic world; we need to stop, breathe and listen. This is a hark that goes back to the ancient civilisations, to the tribespeople, to the sages and shamans. We are being called. Spirit is knocking at our door and it’s getting louder. Have you stopped to listen?